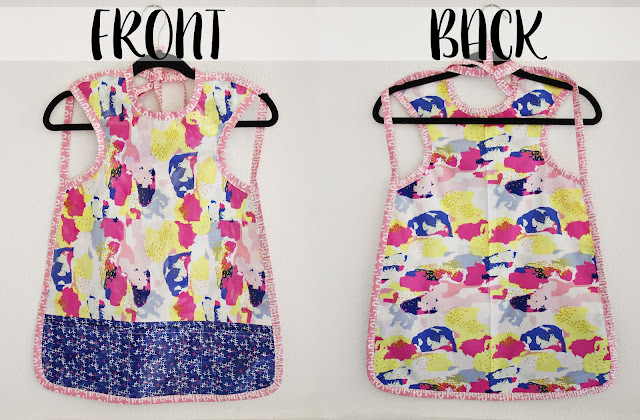 I'm so excited to finally share my Here Comes the Fun fabric projects. 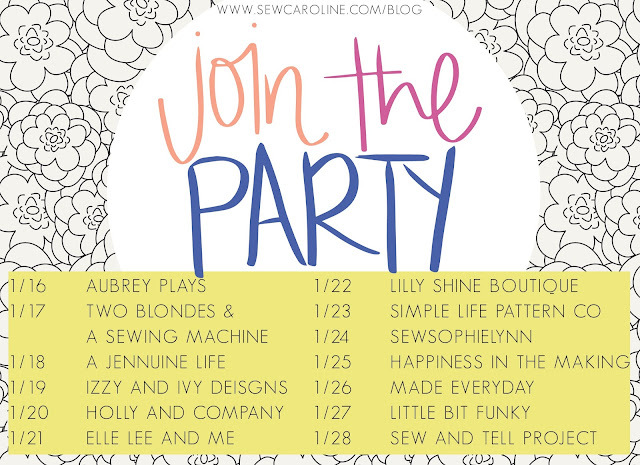 I was so shocked and giddy when Caroline asked me to be a part of this blog hop! If you have never worked with Art Gallery fabrics before, you should know there is something extra special about their fabrics. They are so vibrant and buttery to the touch. 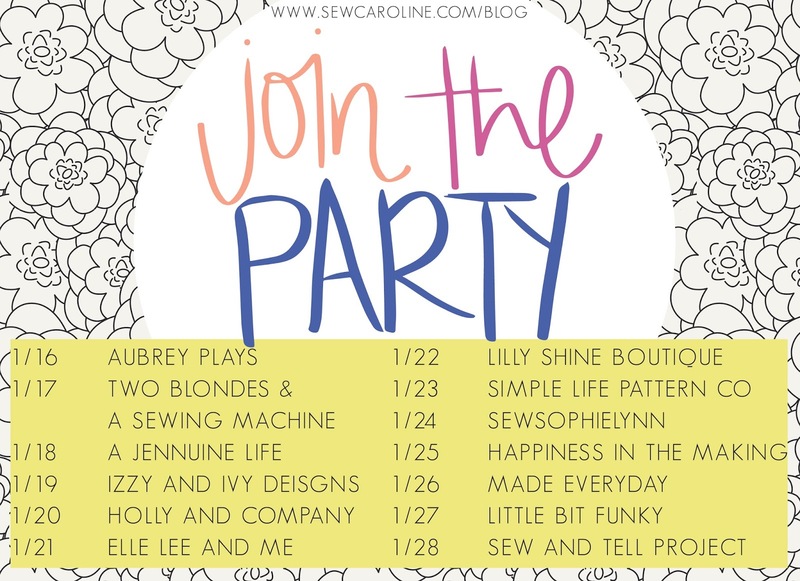 Sew Caroline's new line, Here Comes the Fun, is no exception. The bright colors and bold patterns, are perfect for so many projects, but the first thing that came to my mind was art class. My biggest concern whenever Zoe wants to do art or creative projects, is the mess. The mess on the floor, the table and her clothes. I made this vinyl art smock, to alleviate one of those mess factors. I actually let Zoe pick out the fabrics for this project, since it will be hers to use and love. She of course, chose the brightest and boldest colors. 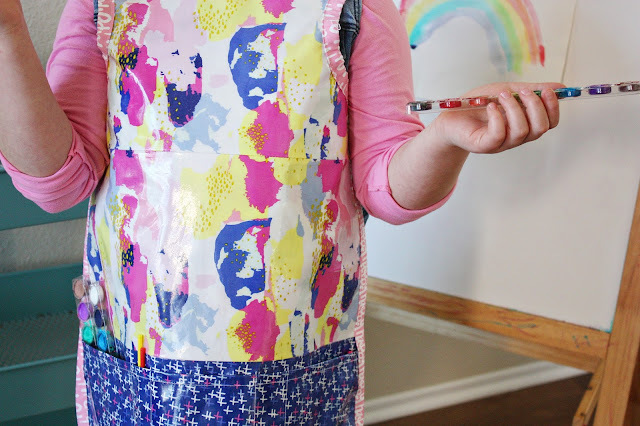 The benefit of this kid's art smock vs. a traditional apron style is how high the neck comes up. It looks like it might be too tight at first glance but it really is the perfect shape to make sure no paint accidentally drips down the front of her shirt. 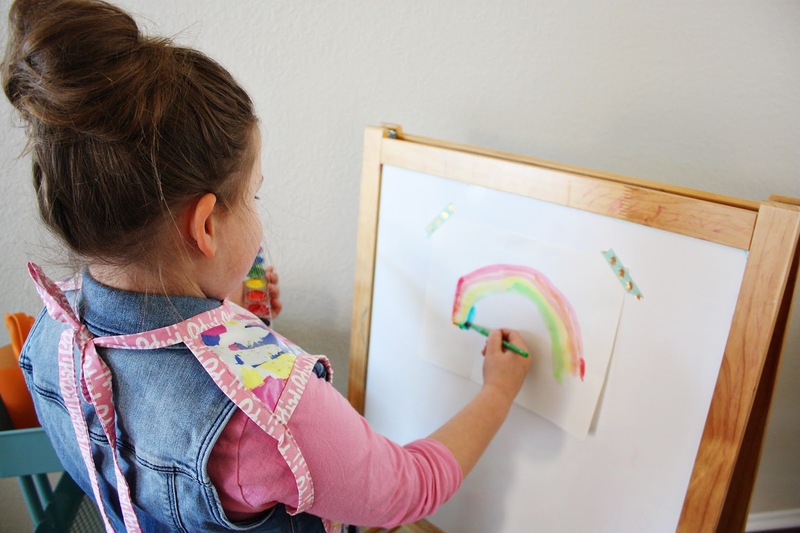 By using the iron-on vinyl, the art smock is now easy to wipe off with a washcloth or paper towel for easy clean up. She was basically hovering over me as I finished sewing the art smock, so anxious to give it a whirl. She is most excited about the small slot pockets on the front to store her many paintbrushes. The bigger pockets on the sides, can be used to store extra paints, markers, pen and pencils, or hands. 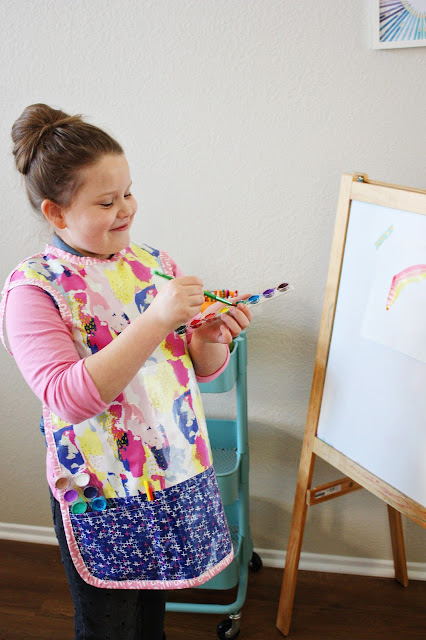 Don't forget to check out the rest of the projects over the next few days and check out the giveaway to win some of your very own Here Comes the Fun fabrics and scissors from Fiskars! I used a pattern from All Our Days as my base design, but added a row of pockets on the bottom section. If you would like detailed instructions on how I added the pocket, Please click on the button below. You can find the original pattern on All Our Days. Caroline was kind enough to let me do not one but two projects! Click on the image below and you can read all about our fun and crazy coloring book leggings!! This is the perfect project for that print!! Love this idea! SO I think you might have won Mom of the Year award with this make. Fabulous!!! And your daughter has a great eye for sure. She mixed the prettiest prints together. Zoe has a true artist's eye! Her choices of fabric are so fun--and I love how she's decorating her leggings :) Way to go, Zoe!